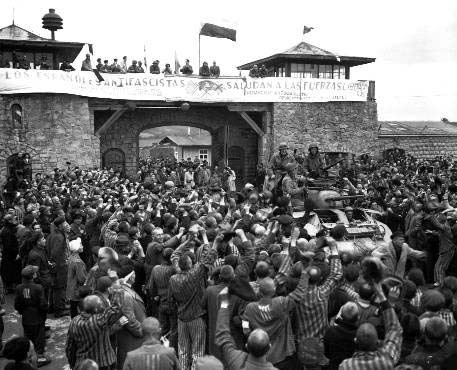 The Mauthausen concentration camp in Austria was liberated by the 11th Armored Division of the US Third Army on May 5, 1945. On the orders of General Dwight D. Eisenhower, the liberation of Mauthausen was re-enacted on May 6, 1945 so that more photographs could be taken. These prisoners were soldiers in the army of the Spanish Republicans, who had fought against General Francisco Franco’s Fascist forces in the Spanish Civil War, and had escaped to France when the Republicans lost the war. The Spanish Republicans were interned by the French and later, when the Germans defeated France in 1940, they were incarcerated as political prisoners because they were opposed to the Nazis. Germany had fought on the side of Franco in the Spanish Civil War, which was a war between the Fascists and the Communists. For the anti-Fascist Spanish Republicans, Mauthausen has the same significance as Auschwitz does for the Jews. 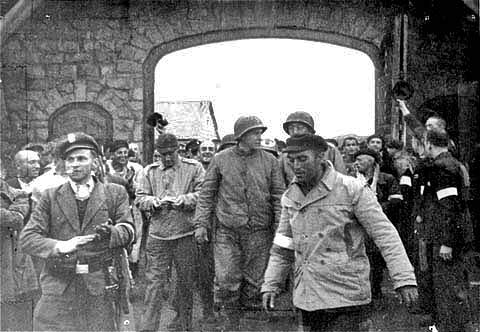 On May 5, 1945, the date usually given for the official liberation of the Mauthausen main concentration camp, a platoon of 23 men from the 11th Armored Division of the US Third Army, led by Staff Sgt. Albert J. Kosiek, arrived at the main camp near the town of Mauthausen. They were guided there by Louis Haefliger, a Red Cross representative in the camp, and two German soldiers, after first liberating the Gusen sub-camp, 6 kilometers to the west. Haefliger had taken it upon himself to go out and find American soldiers fighting in the area. He brought them first to the Gusen sub-camp because of the rumors that Hitler had instructed Ernst Kaltenbrunner to give the order to kill all the prisoners by blowing them up in the underground tunnels of the munitions factories there. 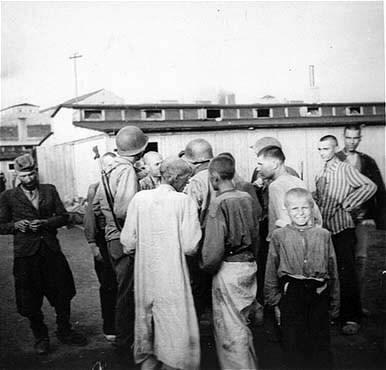 After the prisoners in the Gusen sub-camp were released by the American liberators, fighting broke out among the inmates and over 500 of the prisoners were brutally killed by their fellow inmates, according to Sgt. Kosiek. The platoon of American soldiers was unable to control the released prisoners, so they left the Gusen camp and proceeded to the main camp, where the Communist prisoners were already organized into an International Committee that was ready to take control. According to Manuel Razola and Mariano Constante, two Spanish inmates at Mauthausen who wrote a book called Triangle Blue, in the last days of the war, the prisoners had formed an International Committee, which took over the camp as soon as the American liberators arrived on May 5, 1945. Razola and Constante are quoted by Christian Bernadac in his book The 186 Steps. According to their story, “The international committee had taken the decision to execute the most criminal SS and common-law elements.” On the night that the camp was liberated, the international committee killed 8 of the Kapos in the camp and 6 of the SS officers. In the photo above, crippled survivors of the main camp at Mauthausen pose in front of an M8 Greyhound armored car of the US Army 41st Calvary Reconnaissance Squadron of the 11th Armored Division of the US Third Army. The crippled prisoners had had their feet amputated after suffering severe frostbite. This photo was a reenactment, taken on May 6, 1945, of the liberation the day before. Note the warm coats they are wearing; Mauthausen is located in the mountains of Austria where it can still be cold in the first week of May. Note that the prisoners have been fitted with devices which allow them to walk. On May 5, 1945, the day of the official liberation of the Mauthausen Concentration Camp by American troops, there were approximately 60,000 survivors in the main camp and all the sub-camps, according to Christian Bernadac. This was approximately half as many prisoners as had been registered during the period that the camp was in existence from August 1938 to May 1945. There were approximately 20,000 prisoners in the main camp, but some of them had arrived only weeks before the Americans arrived. According to Louis Haefliger, most of the regular SS guards had left before the Americans arrived and Captain Kern of the Schutzpolizei (protection police) of Vienna had replaced Commandant Franz Ziereis on the night of May 2-3, 1945. The Vienna police occupied the guard posts, assisted by a few old men and young boys of the Volksstrum; most of the SS men had escaped to an island on the Danube river and only a few of them had remained to help in guarding the camp. During the following days I talked with Ziereis about the exact situation prevailing in the camp: lack of bread, clothing, shoes and a dreadful shortage of linens. The camp at Mauthausen was overcrowded, and the camps of Gusen I and II filled beyond human limits. There were as many as five sick men to a narrow camp bed. There were sixty thousand human beings – men, women and children. Ziereis no longer knew where to turn…He speeded up the work of annihilation as much as he could. The Krematorium chimney smoked day and night. The sanitary conditions were at the lowest imaginable level. They were dying of hunger. Ziereis made believe that he was touched by this himself. He put on a self-pitying air, this man with whom I had to take my meals, this monster who once had a truck full of cadavers driven in front of his wife’s window, to boast about his work. At the stroke of noon, May 5, 1945, all the SS had been disarmed, as well as the Volksstrum militia and the reinforcements of Vienna firemen. Chaos prevailed in the camp. The prisoners invaded the kitchens and pillaged the Kommandantur. The men rigged themselves out in several pairs of pants and fought over the tins of food. There was an unimaginable turbulence. Suddenly freed, these prisoners behaved like a horde of savages. It took some time to get the camp to calm down a bit. I thought about my own belongings in my room. Everything had disappeared: trunk, clothing, linens. 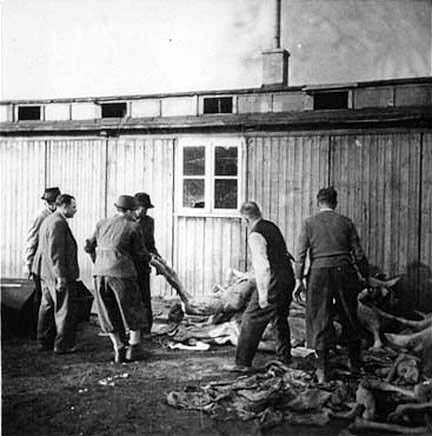 Robert Abzug wrote in his book, Inside the Vicious Heart, that after Commandant Franz Ziereis handed over the administration of the camp on May 2, 1945 to a captain in the Vienna Police, leaving only a small group of SS men to help guard the camp, the prisoners organized resistance operations and began to sabotage the factories. But there was nothing the resistance movement in Mauthausen and the Gusen sub-camp could do about the lack of food, medicine and clothing in the camps. In the chaos of the final days of the war, the transportation system had broken down and everything was in short supply. According to the US Holocaust Memorial Museum, the Mauthausen main camp, and a few of its largest sub-camps, were actually liberated in several stages by the US Third Army in late April and early May, 1945. Col. Richard R. Seibel was appointed to take command of the Mauthausen camp for 35 days, after an American patrol found the camp in April 1945, before the official liberation of the camp on May 5, 1945. In an interview in 1990, Seibel described how the Americans found some stored potatoes and began feeding the starved prisoners a very thin potato soup. There was no wheat flour or yeast in the camp kitchens, so the Americans made unleavened bread out of oats and dried it before giving it to the starving prisoners. 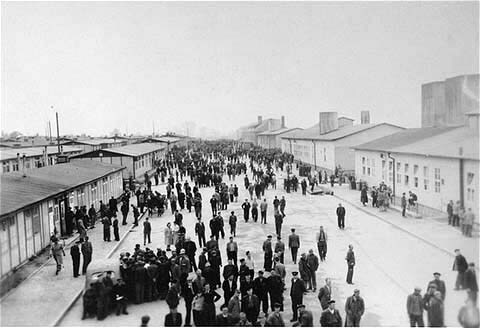 In the weeks just before the official liberation, most of the smaller sub-camps had been evacuated and the prisoners brought to the larger camps. 20,000 prisoners were crowded into the Mauthausen main camp which had a normal capacity of 12,000. Food was scarce and there were typhus epidemics in all the camps; around 300 prisoners were dying from typhus each day in the main Mauthausen camp shortly before the Americans arrived. A movie that was being shown in the Museum at the Mauthausen Memorial Site in May 2003 featured an American soldier who was among the liberators of the camp. 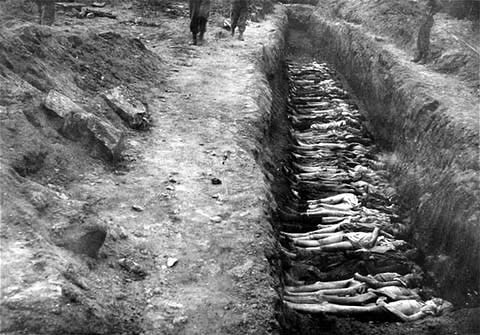 He became very emotional as he said that “we must have buried 12,000 bodies.” He explained that 1,200 bodies had been buried in mass graves the first day and 300 per day thereafter, as a film clip of Austrian civilians loading naked bodies onto carts was shown. There were rumors circulating among the prisoners in the Mauthausen camp that Ernst Kaltenbrunner, who had the supreme authority over all the Nazi camps, had issued orders that all the prisoners should be killed before they could be liberated. This order had supposedly come from Hitler himself before he committed suicide in his bunker on April 30, 1945. Patton’s Third Army had liberated the Buchenwald concentration camp on April 11, 1945 and Hitler had reportedly become enraged when he heard about how the Americans had given guns and jeeps to the liberated prisoners so that they could go to the nearby city of Weimar and randomly attack civilians. Mauthausen was primarily a concentration camp for Communist political prisoners and German criminals, but near the end of the war, it was also an “end destination” for Jews who had been evacuated from the death camps in what is now Poland. According to Yehuda Bauer, the author of The Death Marches, January – May 1945, there were 700,000 prisoners of all categories in all the Nazi concentration camps in January 1945, and between 250,000 and 350,000 of them died on the death marches in the last weeks of the war, or after their arrival in the German camps, or after the liberation. At least half of those that died after January 1945 were Jews, according to Bauer. 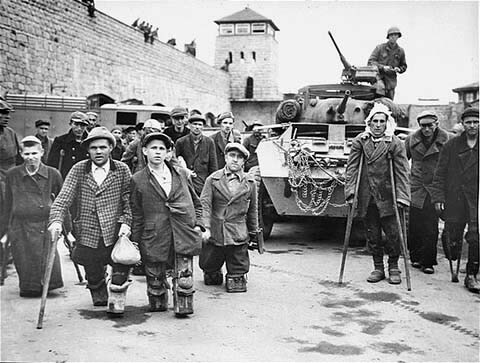 At the time of the liberation there were also Hungarian Jews in Mauthausen who had been sent directly from Auschwitz to Mauthausen and the Gusen sub-camp in 1944 to work in the munitions factories. On March 30, 1945, there was a total of 78,754 men and 2,252 women in the Mauthausen main camp and all its sub-camps, according to a display in the Mauthausen Museum, which I visited in May 2003. Included among the men were 13,701 Jews, and among the women, there were 611 Jews. This was the last census taken by the Nazis in the final chaotic days of the war. The total included 13,852 men and 1,238 women at the main camp at Mauthausen, according to the Museum display. There were 91 Jewish women and 2,257 Jewish men at the main camp on this date. We saw that the Americans were coming, and so did the Germans. Suddenly a German Kapo appeared, a bloated primeval beast whose cruelty included the bare-handed murder of dozens of Jews. Suddenly he had become weak and emotional and he began to plead with us not to turn him in because he had “done many favors for the Jews to whom that madman Hitler had sought to do evil.” As he finished his pleading three boys overpowered and killed him, there in the same camp where he had been sole ruler. We killed every one of the German oppressors who fell into our hands, before the arrival of the Americans in the enclosure of the camp. This was our revenge for our loved ones whose blood had been spilled at the hands of these heathen German beasts. It was only by a stroke of luck – even if tainted luck – that I had survived. Roman Frister, a young Jew who had just arrived at the main camp a few days before the liberation, on a death march from a work camp in Vienna, wrote in his book, The Cap: The Price of a Life, that one of the liberators who emerged from an American tank was a black soldier. According to Frister’s account, the black soldier called to the armed guards in the watch tower “Hitler kaput,” and signaled them to come down from the tower. The American Army was segregated during World War II, so Frister may have been mistaken about the black soldier, although another survivor, Bert Schapelhouman, told a similar story. There was also a “sick camp” outside the gates of the Mauthausen camp which was for prisoners who could no longer work. The photo below shows the “sick camp.” The young boy facing the camera seems to be in remarkably good health, considering that he is with the sick prisoners. Maybe his mother was sick and he was just staying with her. The photo above shows Austrian civilians who were brought to the camp to bury the bodies of prisoners who died in the Russian POW camp, which had been converted into a camp for sick prisoners. A typhus epidemic was raging in the camp and as many as 300 prisoners were dying each day. According to Holocaust historian Martin Gilbert, there were 3,000 prisoners who died after the liberation, before the typhus epidemic could be brought under control. The American liberators used DDT to kill the lice in the camp; typhus is spread by body lice. The civilians were ordered by General Dwight D. Eisenhower to wear their best clothes to bury the dead prisoners and they were forbidden to wear gloves to protect themselves from contracting contagious diseases. This was done in all the camps as punishment for the civilians who had not stopped the Nazis from putting prisoners in concentration camps. 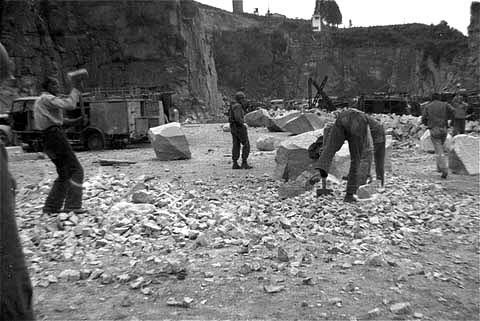 The SS men who survived the liberation of Mauthausen were forced to work in the quarry as punishment. The Mauthausen concentration camp became a camp for Displaced Persons who were waiting to emigrate to other countries after the war. 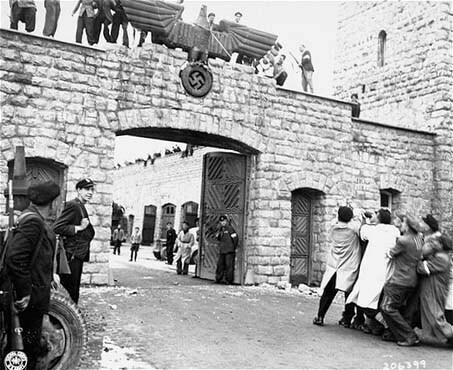 After World War II, Austria was divided into occupation zones and Mauthausen was in the Soviet zone, which meant that the Soviet Union was entitled to the spoils of war at Mauthausen. The American military had until July 1945 to illegally remove machinery from the underground munitions factories before the camps had to be turned over to the Soviet Union on July 28, 1945, by prior agreement. On September 10, 1945, the Soviets began taking equipment from the Gusen underground factory where the Nazis had been building Messerschmitt jet airplanes. The removal of the machinery was completed by December 21, 1946. In July 1947, the final transport of equipment from Gusen to the Soviet Union was completed. On November 15, 1947, the tunnels where the factories were located at Gusen were destroyed by the Soviets. The Soviet Union also took charge of the quarry at Gusen and continued to take stone from it, operating under a company called Granitewerke Gusen. In 1955, the Allied occupation of Austria ended and the Soviets moved out; the railroad and the station at Gusen were dismantled. The property that remained after the Soviets left was given to the Austrian people. In the late 1950ies, the land in the Gusen area was privatized and private homes were built where the camps used to be. My uncle, Walter Spier was liberated from Mauthausen. He is still alive. He does speak about his experience to small groups in his synagogue. My father, William D. (Dwight) Webb, of Alabama, was among Patton’s Third Army troops which reportedly helped to liberate this particular camp. My dad so seldom ever talked to us five children about the war. In fact, all I remember his saying about the concentration camp was that “it could be smelled from miles and miles.” David Wyman, in his book, “The Abandonment of the Jews,” asks, “Where are the Americans?” Well…they were on their way! They first had to cross France, Germany and fight the mighty Nazis army. So much U.S. red tape and bureacracy were piled on top of them, too. [And it’s true that more Jews may have been saved by allowance into the U.S., but it seems most of them were “locked” inside Europe.] I don’t mean to be callous, but if it hadn’t been for the U.S. troops, perhaps all of European Jewry may have perished rather than 2/3’s. As far as I am concerned, my father was a hero. But he never received a single honor or medal for what he did–he wouldn’t have accepted it, anyway; he was too humble. I believe that whenever the United States soldiers stepped upon Normandy’s shores, they knew intuitively and instinctly that an evil existed which had to be stopped — even if they had never heard the words Auschwitz or Mauthasen-Gusen. [Still, as it has been said, the horror of those camps had to be seen to be believed.] My siblings and I have all the letters that my father wrote home to his parents and sisters during the war as well as some other of his memorabilia. I would someday like to “publish” them all. Prior to going into Germany (and other countries), my dad was literally saved by a flock of sheep near St. Lo, France. It’s a beautiful and symbolic story! [By the way, my father may have helped to liberate the survivors of an additional concentration camp, but we are not sure which one.] Thanks for your time! If you wish to send me an email, my address is lwsmith253@yahoo.com. My dad was a medic in the Army Medic Corps attached to the Third Army and he was at Mauthausen-Gusen when it was liberated. He attended to many of the sick and dying there. He brought back photo’s or the horror there and told us kids what the Nazi regime had done to the people there. My father Homer E. Brown was with the first group that entered the camp on May 5th. If anyone is interested or (if you knew him) he related many stories about that day to me.. Please feel free to contact me. My father Harry Berkemer was with the 41st Calvary of the 11th Armored Division, said to be among the first to reach the camps. We have a very impressive Nazi sword, dagger and medals that I believe was taken from an officer there, although my father never mentioned it. My Dad, Frank Neuberg,was there with the 11th armored on May 5th. He was a forward observer, artillery spotter, and along with his group of six? others got to the gates first. They saw an elderly Weirmacht soldier throw his rifle on the ground and it was picked up by a prisoner who shot him in the jaw. All of his testimony was registered with the U.S. National Holocaust Museum. Paul, is your father still living? I work with an educational program to teach college students about WWII from firsthand accounts. I have contacted the USHM in Washington and they cannot find your father’s account. Could you please be a little bit more specific about it? I am very intersted in it, since my grand uncle was among the liberated, member of the International committee in the camp, and very involved in its liberation. Thank you very much.